We Made It! We’re in American Theatre! 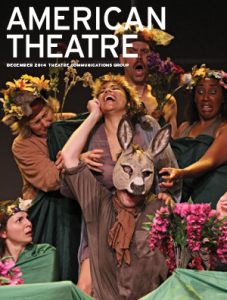 American Theatre devotes four pages of its December 2014 issue to a “reduced” history of the Reduced Shakespeare Company. Featuring interviews with founding members Daniel Singer and Jess Winfield, critic Bob Mondello, and managing partners Reed Martin and Austin Tichenor, it only manages to cover the RSC’s first decade or so — clearly a sequel article will be required! Shakespeare wrote, “Brevity is the soul of wit”. Had he seen his complete works abridged by the Reduced Shakespeare Company, would he have added “…but this is ridiculous”? It’s a terrific piece. Read the whole thing here. Thank you thank YOU! For corrupting the next generation of students! At the risk of sounding greedy, I hope too you’re assigning our irreverent reference book Reduced Shakespeare: The Complete Guide for the Attention-Impaired (abridged). Thanks for sharing the love! We just finished reading Macbeth in my English IV classes. Last year I showed The Reduced Shakespeare to my seniors, and I am doing it again this year. Just wanted to thank you for the amazing “version” of Shakespeare’s plays. My seniors love it, and it is so wonderful to see them laugh and get the humor of your performance. I even have some want to know if you are still on tour or where they can get the DVD. No better compliment than that from a group of teenagers. Thank you, thank you, thank you.